Chocolate-Covered Salted Crickets and Spicy Superworms, Oh My! We had a great time exploring the businesses under incubation by the non-profit La Cocina at this year’s Winter Fancy Food Show in San Francisco. Suzanne (pictured) gave us an enthusiastic rundown of Don Bugito, a Pre-Hispanic Snackeria. Don Bugito has two new exciting products — Chocolate-Covered Salted Crickets and Spicy Superworms. Unfortunately, I didn’t get a chance to chomp a grasshopper or the like, but I would have and definitely will when the next opportunity arises. You can get these tasty healthy treats at the La Cocina kiosk at the San Francisco Ferry Building; also check out: Don Bugito. Learn more about the fine work La Cocina SF is doing to help fledgling food entrepreneurs, here: La Cocina SF. 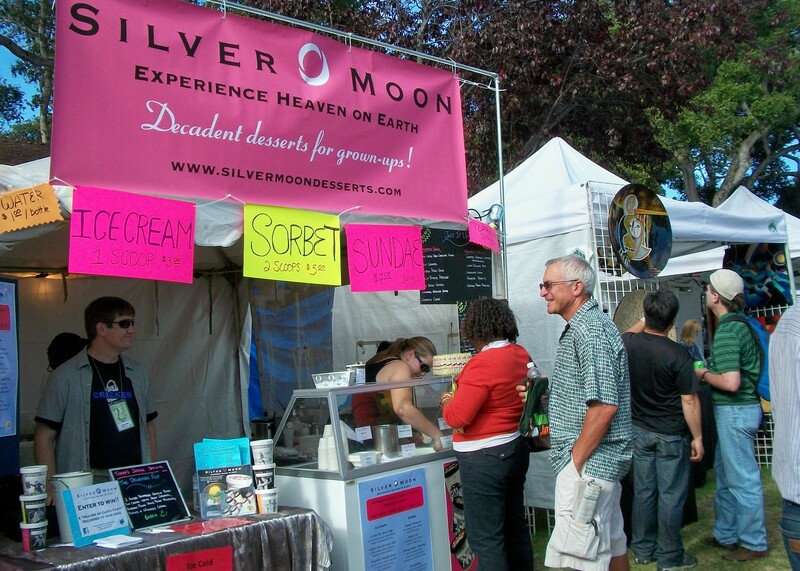 Silver Moon Desserts was selling their award-winning liquer-infused ice cream and sorbets at the 53rd Annual Monterey Jazz Festival, and so we offered to help out. And perhaps catch a few tunes. Silver Moon CEO Sheri Tate and her right-hand woman Aliye Melton created a variety of gourmet sundaes especially for the event. Never really considered myself a big jazz aficionado but thought it would be a hoot to scoop ice cream and soak up the plentiful cool-cat vibes. Sundae-making actually turned out to be rewarding, especially when I was forced to eat a spoonful of hot fudge every so often. For quality control purposes, of course. When Sheri wasn’t looking. It was also a genuine thrill to see the reactions of people who were getting their first taste of the Silver Moon Desserts phenomenon. Lots of “Wows!” and “Amazing!” and “Oooh, that’s GOOD.” And you could tell people meant it by their body language and big eyes; they weren’t just being polite. But truly wonderful was the experience of being exposed to incredible artists who blew me squarely into diehard jazz fandom. Even in the food pavilion, we could hear – feel – the riveting magic of Troy “Trombone Shorty” Andrews and his band Orleans Avenue. “…From the opening blast of his trombone, the youngster from the Big Easy had the audience by the scruff of the neck and shook it for all it was worth. Andrews was on both trombone and trumpet and backed by a smoking-hot band. The rising star had a usually laid-back arena crowd on its feet, clapping, dancing and responding to his frequent call-and-response rejoinders.” More here. 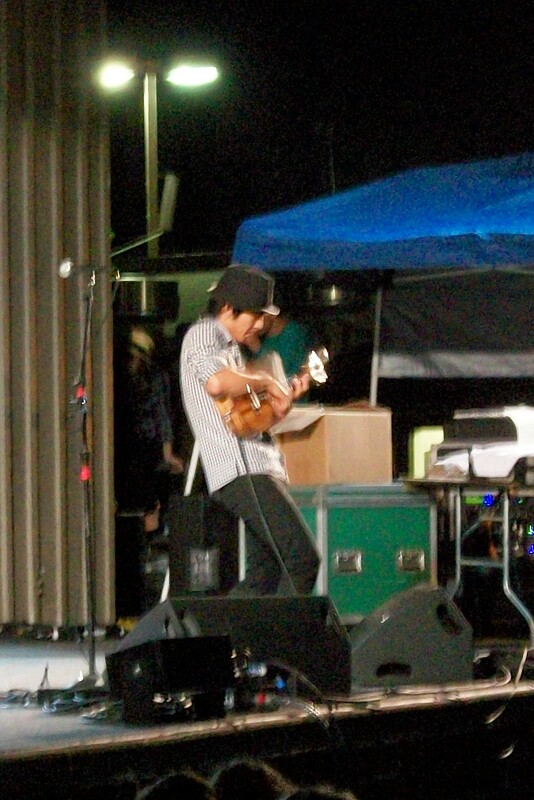 And then there was Jake Shimabukuro and his transcendent Ukulele. I love music across the spectrum –rock, alt, folk, country-fried, Swedish techno-goth, yet never had really considered delving into the ukulele oeuvre. By pure wonderful chance and having no idea what was on tap, we got a seat just as the Hawaiian legend took the stage. Jake introduced himself, talked a little about how he got his first ukulele when he was four years old, and his different influences. Then he began to play. His music: beautiful, evocative, humorous, complex, intense and deeply moving. 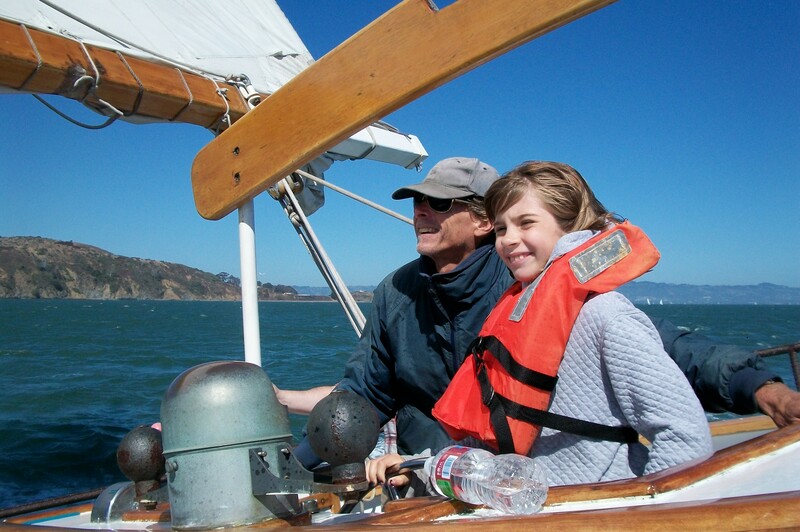 (Again, there are others who can recap it better than I – check out Blog Monterey for more.) Suffice to say we were stunned by this young man and his talent. The appreciative crowd of at least 500 was transfixed and utterly still as he played. The first song hooked us, the second, “Blue Roses Falling” blurred my vision and then he completely sent me into quiet hysterics with renditions of the Beatles’ “In My Life” and Queen’s “Bohemian Rhapsody.” We could almost hear the late great Freddy Mercury in the uke’s expressive voice. 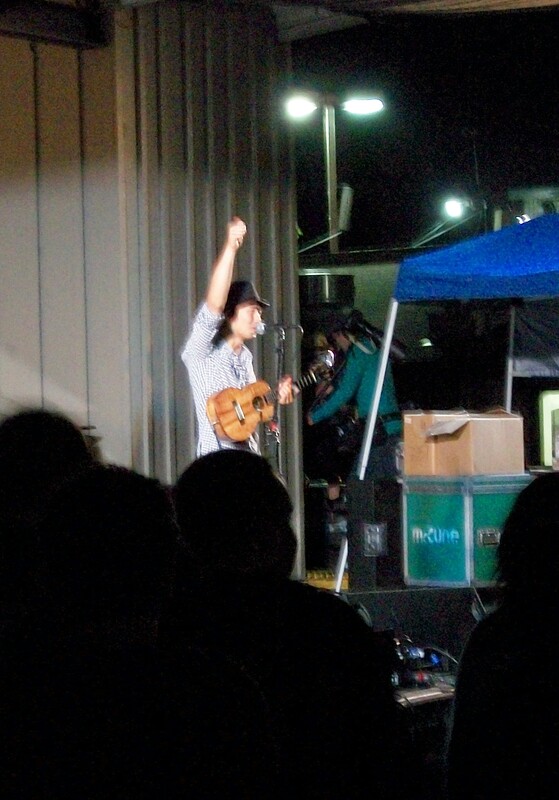 Above: Jake soaks up the crowd’s adulation after his wondrous encore rendition of “While My Guitar Gently Weeps”. 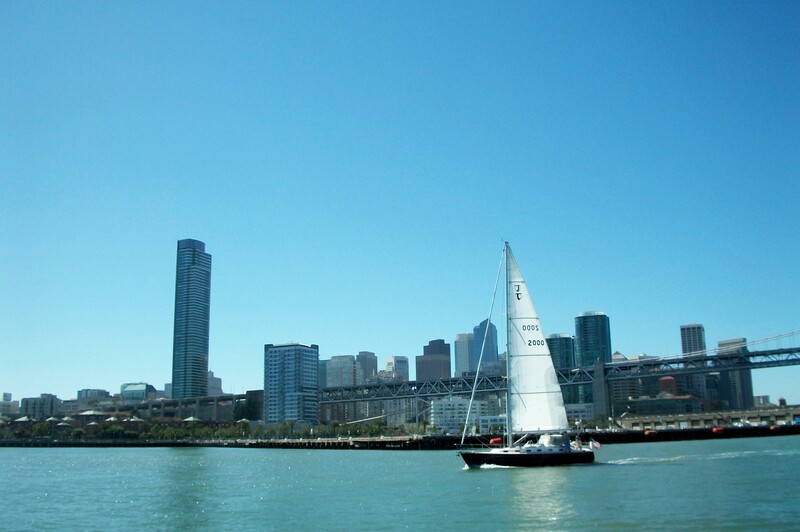 Ahh, what a beautiful day for a sail on the shimmery San Francisco Bay, courtesy of our favorite liqueur-infused artisan ice cream and sorbet creator, Silver Moon Desserts. This past Sunday, Aug. 22, Silver Moon’s CEO Sheri Tate chartered The Bay Lady, the largest U.S. Coast Guard-certified schooner in Northern California, to host a party of SMD fans, associates and well-wishers. We met under a perfectly cloudless azure sky at Rendezvous Charters, where the kindly Captain Steve and his crew welcomed us aboard, listed the maritime rules and then proceeded to guide our ship across (mostly) smooth waters. Heading out from Pier 40 we passed under the Bay Bridge, sailed past Alcatraz Island and almost to Angel Island, the whole time enjoying gorgeous panoramic views of San Francisco’s skyline, the Golden Gate, and the East Bay hills. We could also see, from a distance, the $300 million Russian Mega Yacht that recently floated to California and is owned by super-rich Russian guy 38-year-old Andrey Melnichenko (energy, fertilizer and banking concerns). The SMD party tossed around some ideas for getting the gazillionaire Mr. Melnichenko’s attention. A wet-suited Sheri Tate swimming up to the ship bearing a lovely pint of Pomegranate Martini, or perhaps a vigorous lobbing of said pint toward the leviathon? Alas, we never did have the opportunity to share Silver Moon treats with, nor offer an exclusive investment opportunity to the extravagant Muscovite yachtsman. Inspired by the EatAtBurp site (great find, by the way! 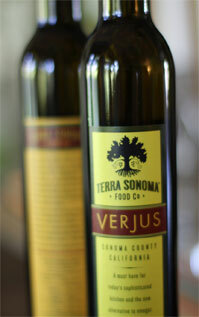 ), I am compelled to experiment with simple syrups infused with herbs. The garden is gloriously overgrown and the herbs are in danger of going to seed. Trying to find creative new uses for basil, sage, thyme, rosemary, lemon balm and, my favorite, lemon verbena. The basil is definitely being appreciated. We’ve been eating our favorite summer salad often practically ’round the clock – California Caprese — with the California being an ample layer of avocados. Also made Francis Lam’s amazing weapons-grade ratatouille and used plenty of thyme and basil. A blackberry sorbet with a basil-infused simple syrup — OH MY… Delicious. The latest successful concoction was an amazing Lemon Verbena Simple Syrup. My dear neighbors have a gigantic lemon verbena shrub they regularly try to subdue with all manner of pruning and hacking, but that baby just keeps coming back stronger than ever. Thankfully. My many attempts at growing one of these shrubs have been abject failures. So I’m always looking for ways to use this heavenly scented herb. The first time I smelled it, I almost swooned. I love lemon, lemon balm… But the Lemon Verbena struck me (and still does after constant almost-demented sniffing of the crushed leaves) as lemony-cotton candy-something-magical. I keep leaves in a jug of water to inspire more H20 imbibing, and I’ve tucked a few leaves in a little covered jar of sugar for sprinkling here and there. Next plan a savory sweet syrup for meat glaze… perhaps rosemary and sage? In any case, an herbal syrup is summer in a bottle. The Burp link tells you how to make it and I’m doing the 2:1 ratio so it keeps longer. Silver Moon, California Country: Here’s to Spirited Partnerships! 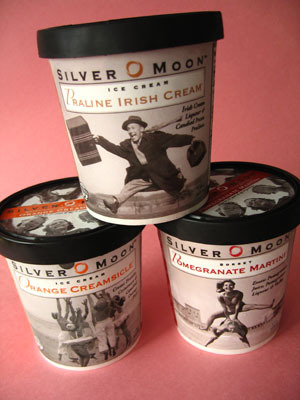 Over the moon for new ice cream. Growing up in the 1970s in a traditional small town I heard, over the howling North Dakota wind, the tantalizing phrase “Women’s Lib.” You don’t hear this anymore because the terminology is considered old-fashioned, embarrassing even. Probably because the words were usually spoken in a tone of disparagement with lots of eye rolling involved. In the intervening decades, girls have grown up with the understanding that the world is their oyster and they can pursue any career that interests them. Women are now represented in professions across the board, but there is still a serious lag in the science, technology, engineering and mathematics (STEM) careers. Although it’s been proven time and again that there are absolutely no gender differences in math and science abilities, somewhere in middle school girls began to lose interest or have doubts. To be competitive, innovative and creative in the sciences, the United States needs bright young people of both sexes contributing their brainpower to the world’s many vexing problems. We are incredibly fortunate here in the Bay Area to have the Expanding Your Horizons (EYH) Network programs that encourage young women to pursue STEM careers. Founded by San Francisco Bay Area women scientists in 1974, the EYH Network coordinates more than 86 hands-on math and science conferences in 33 states, as well as Thailand, China, Singapore, Malaysia, Brussels and Geneva each year. Nearly 800,000 young women have participated in EYH conferences since its origins, and many participants are now professional women scientists working in chemical and civil engineering at places like the Lawrence Livermore National Laboratory, Network Appliances and Elan Pharmaceuticals. Next week the National Science Board will present the Expanding Your Horizon Network with its highly prestigious 2010 Public Service Award as an organization that has made significant contributions and impact in public understanding of science, technology, engineering and mathematics. The award ceremony will take place at the U.S. State Department in Washington D.C. on May 4, 2010. Aaah, sampling delectable food… My first encounters with the delights of sampling was when the folks took us to cavernous Sam’s Club when we were kids. Even if it was not clearly identifiable or even tasty, if attached to a toothpick, it was free and had to be eaten. My tastes have matured and I’ve still not willingly turned down a free sample of any new or interesting food. 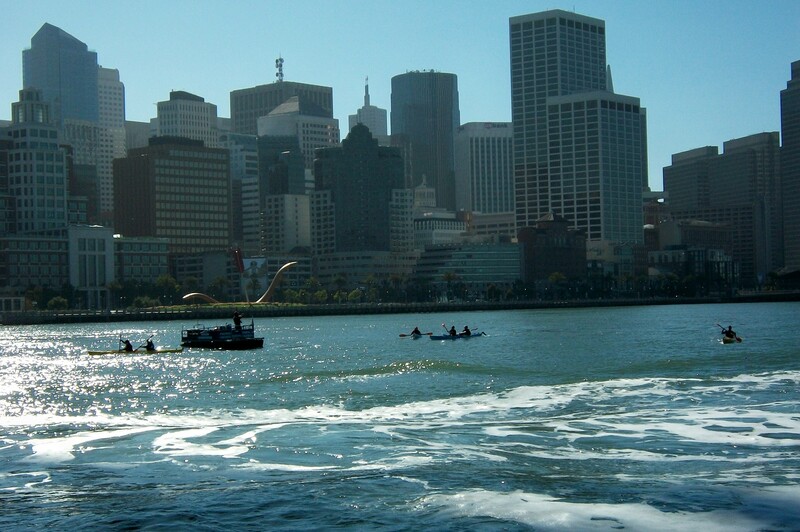 So imagine the thrill of attending the San Francisco Professional Food Society’s annual BBQ last week. The SFPFS is one of the country’s oldest organizations for professionals working in the food industry with nearly 400 members drawn from all sectors of the professional food world. Food journalists, chefs, artists, farmers, vintners and sommeliers, event planners, caterers, retailers, suppliers, food scientists, etc… They know their stuff — what fun to be in an setting where your passionate food professionals and artisans are all trying to impress one another! SavorCalifornia.com, an organization that showcases the best of the Golden State’s amazing gourmet food and beverage industry, provided the food for the BBQ. Owl A and I wandered among the booths sampling with abandon. We were hard-pressed to find anything we DIDN’T like, everything was high quality and delicious. We had the pleasure of speaking with the friendly and well-informed President of the US Division, Greg Warwick, who poured us generous samples, told us the story of Fentiman’s, and even gave us a surprisingly tasteful lesson in the sadly obscure Victorian art of “furtling”. Fentiman’s beverages are still made in the time-honored tradition by brewing and fermenting herbs and milled roots over seven days. (This compares to just hours’ production time for typical soft drinks.) 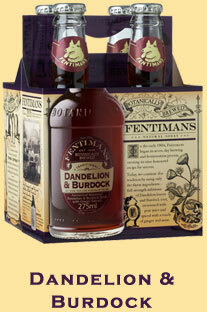 Since its founding in 1905 with a Ginger Beer recipe, Fentiman’s has been brewing sodas in an array of unique flavors, including: Dandelion & Burdock, Curiousity Cola, Mandarin & Seville Orange Jigger. They opened a production plant in the US in 2007, have gotten some great press and accolades, and are working to expand their distribution sites. We’d love to see their product in stores across the country, they’re delicious and different. Silver Moon brilliantly paired its refreshingly light, lime and rum infused Mojito Ice with its exotic Mediterranean Pomegranate Martini, drizzled with a decadent rum-mint sauce. This dessert was the perfect ending to a perfect meal. Many more we’d love to talk about and will perhaps in a future posting. We got a big kick out of the caffeinated ebullience of “Travelin’ Joe” of Travelin’ Joe Espresso Catering, loved Sweet Earth’s Grilled Vegetarian Seitan, the first Seitan I can say with enthusiasm was delicious, and were happy to see others we had met at the Winter Fancy Food Show still out there and growing. In the spring of 1969 an estimated 3,000 young people descended on the tiny prairie town of Zap, N.D., for a spring break blow-out. What started as an off-beat idea for a party ended with National Guard troops routing the beer-addled revelers from Zap and nearby towns, creating a national sensation (even international, with a report appearing in the Soviet Union’s Pravda). Zap Revisited, a film by West Fargo, N.D., native Chris Breitling, recalls the strange-but-true story of the “Zip to Zap“, aka the “Zap-In” through the memories of the people who took part in this uniquely infamous episode of North Dakota history. Breitling produced Zap Revisited as a film student in the early 1990s. In conjunction with this year’s 40th anniversary celebration, Breitling is making his DVD available for $12, free shipping, at www.ZapRevisited.com . Thousands of young people poured into town from all over the Midwest, out-numbering residents at least 10 to 1. Accounts differ as to what exactly caused everything to go downhill, but it seems a beer price increase led to fights, fires and finally shambling treks to the nearby towns of Hazen and Beulah. Zap’s mayor, fearing his town under threat, was forced to request the state’s National Guard troops. Back then, the nightly news beamed Vietnam body counts along with colorful scenes of hairy hippies and impassioned students yelling, marching and clashing violently with police. Generally carrying on in a manner alarming to a more sedate generation. Almost any en masse gathering of young people in the late ’60s triggered concern. But for the most part North Dakota’s college students were relatively clean-cut and responsible folks. In fact, at a rather tense University of North Dakota student sit-in, a hat was quietly passed around to collect change for a window accidentally broken during the gathering. A far as who did what to who in the what now, Zip to Zap organizers and the townspeople seem to agree that it was only a handful of “bad apples” — bad apples who probably weren’t even genuine North Dakotans — who caused most of the trouble. The editor whose pen started it all felt awful about the whole debacle and reportedly hid out in his parents’ house ’til things died down. He managed to stay out of Zap for 40 years except on one occasion when he couldn’t avoid passing through (but he slunk down far in his seat so as to not be noticed). The universities’ student governments eventually paid for the damages and everyone was very sorry about the whole thing. Pick up Zap Revisited here: www.ZapRevisited.com, read more about the “Zip to Zap” on Wikipedia, or just Google around and you’ll find anniversary stories on the subject. 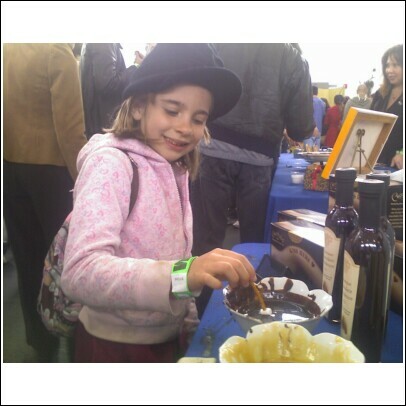 On a beautiful, lightly raining San Francisco spring day last weekend, a Media Owls contingent (Small Fry and I) attended the 3rd Annual International Chocolate Salon. “Chocolate aficionados, fanatics, buyers and journalists can experience the finest in artisan, gourmet & premium chocolate in one of the world’s great culinary metropolitan areas” was the clarion call. More than 50 talented confectioners hawking the very best they had to offer in chocolates, wines, sauces, even skincare. Fort Mason was absolutely packed. Maybe a little too packed. I bought my ticket early so it was $20 instead of the $25 charged at the door, but I’d gladly pay double if it would cut down on the masses. The chocolatiers would cut up a truffle, say, into minuscule tidbits and everyone would crowd madly around to get a sliver. It made me think of pigeons jostling each other for breadcrumbs. Small Fry and I certainly had our share — amazing how fast one feels stuffed while partaking in teeny tiny bites. Some faves standing out in the cocoa blur: Van Gogh Chocolate Vodka (www.vangoghvodkda.com) – yummm. And Vermeer Dutch Chocolate Cream Liqueur also a winner. Coco Delice Fine Chocolates were sublime. I had tasted several others by the time I found Coco Delice, and you’d think I was chocolated-out. But Master Chocolatier and Owner Dennis Kearney outdid himself. Sweet Beauty Organic Chocolate Spa, a company out of Seattle (sweetbeautyspa.com) drew a crowd. Owner Lisa Schafer has created a scrumptious, handcrafted line of spa and beauty products based on pure chocolate: Chocolate Milk Bath, body scrubs, lotions, cream, body wash, masques, lip balms, along with an all-natural line for little people. 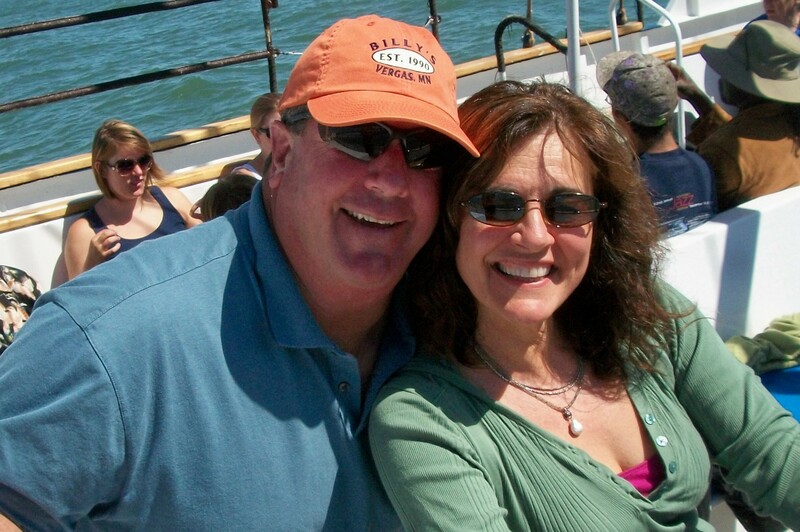 Our website went live today, thanks to the fabulous work of Mr. Cardoza at Kazoo Software — thanks, Joe the Genius!